A not so standard card routine the audience will remember for a long time. The spectator is asked to choose a card (no force). The card is then returned and shuffled within the deck. The performer talks about being on night out, and getting somewhat drunk and forgetting where he lives, but help is always at hand from the Beer Taxi. A few cards are taken from the top of the deck and laid out as a road, the performer shows the Beer Taxi, and asks the spectator to push it along the road. The taxi stops dead on one card, which when turned over (of course) is the spectators. 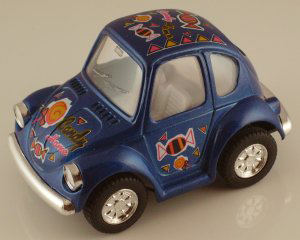 Simply enter your details below and we will send you an e-mail when “Lovely Car Buggy - Trick” is available to ship!